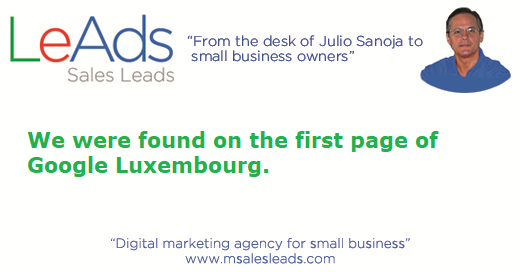 An international sport federation from Luxembourg found our Miami digital agency on the first page of Google Luxembourg, and invited us to bid on a creative concept project. This last week our Miami digital marketing agency, received an invitation to bid on a creative concept project for an international sport federation located at Luxembourg. We are still surprised how an international sport federation from Luxembourg found our Miami agency on the first page of Google and invited us to bid on the creative concept project. 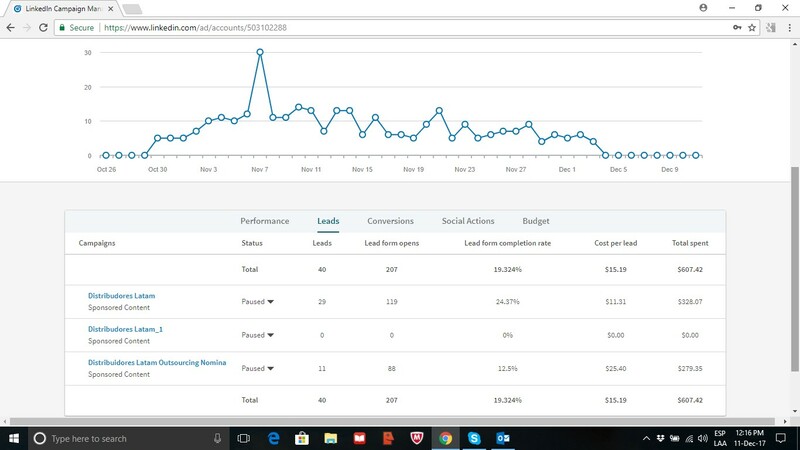 We decided to write this short article about this event just to show, to small and mid-size business owners, that to be on the first page of Google search results is a strategic digital marketing objective, and a very efficient and effective lead generation tool from all over the world. This time from Luxembourg to Miami. We are happy, very happy. During our 2 years old as a Miami digital marketing agency, we had never got a qualified lead from Europe so far, and this is the first one of many to come, thanks to Google and thanks to our 2 years SEO efforts. Thanks Google. There are two relevant events here. First one to find our Miami agency on Google at Luxembourg; and second, to pass a curative process and be selected among other agencies to bid on the creative concept project. This show us that we are doing something good. To be at the first page of Google search results give your business authority and trust. Be found on Google is a must for small and mid-size businesses around the globe nowadays. Our agency has been working hard, for the last two years, since founded, to rank high on Google search results. We have written, published, and distributed, near 250 articles about our products, services, and customer needs. We are getting there. For obvious reasons we will not mention the international sport federation name since the bid submission deadline is on march 23rd 2018, and the publication date of this article is previous to the submission date. We will write a future article about the bid outcome and results, and then, we will mention the sport federation name. For the time being we consider that mention the international sport federation name is not relevant, but what is relevant is that an international sport federation in Luxembourg found on Google a digital marketing agency located in Miami, and invite it to bid on a creative concept project for their international sport events and for their media concept. Keep writing. SEO works. Thanks to Google, thanks to our copywriters, thanks to our digital marketing consultants and strategists. Our Miami digital marketing agency is appearing at the first page of Google search results in Europe. We are happy, very happy. SEO works. Keep writing. How ok2go got 40 qualified leads in one month? 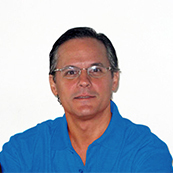 On October 12, 2017 David Stone, Director at ok2go Latam, contacted us to request help for the following need: “I need someone to help me put some adds in LinkedIn and other social medias to look for distributors in Latin America, this has to be in Spanish”. Ok2go needed distributors in Mexico, Colombia, Peru, Ecuador, and Argentina. Ok2go develops and sells software and apps for human resources presence and assistance control. Ok2go wants to develop the Latin America market by selling through local distributors in each of the mentioned countries. Distributors must be local companies, and must be IT distributors, and/or payroll outsourcing companies. From October 12 to October 16 David and I talked several times by phone, email, and LinkedIn message to agree upon the price and scope of our services. On October 17 we began the consulting and strategy phase. On October 21 we delivered strategy and proposal. The strategy we designed was based upon two LinkedIn Sponsored Content campaigns. One campaign, targeting IT companies by industry type, in the mentioned countries. The other campaign, targeting payroll outsourcing companies in the mentioned countries, by company name. On October 22 we began the LinkedIn banner design. On October 30 we launched the two LinkedIn Sponsored Content campaigns. From October 30 until December 3 ok2go obtained 40 qualified leads from Mexico, Colombia, Ecuador, Peru, and Argentina, with an advertising investment of USD $ 607.42 giving a cost per lead of $ 15.18 per lead. On December 4 we paused the campaign because ok2go had enough qualified leads and enough work to convert those leads in distributors. By the date we are writing this article, December 12, ok2go has 2 qualified leads for distributors in each of the following countries: Mexico, Colombia, Peru, and Argentina. Only one month, and 2 LinkedIn Sponsored Content campaigns was enough to get the distributors needed for ok2go to develop the Latin America market for the ok2go products and services. With an investment of only $ 607.42 in advertising. LinkedIn Sponsored Content campaigns is a very efficient tool to get qualified leads for B2B campaigns. 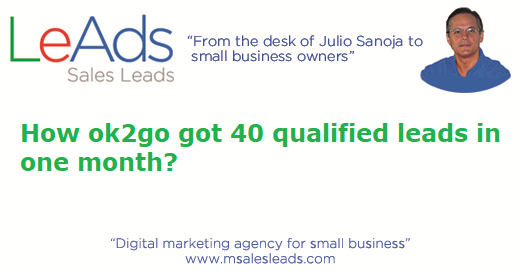 This article was written by Julio Sanoja Rial, CEO, founder and digital marketing consultant at MSalesLeads, a digital marketing agency for B2B small businesses. We help B2B small businesses to go and grow their businesses online. 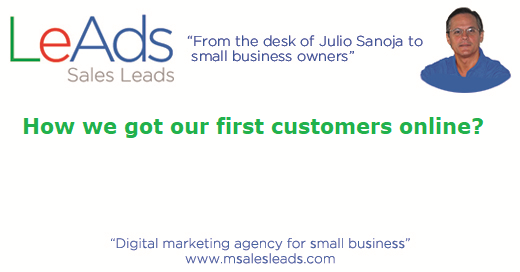 We help B2B small businesses to get qualified sales leads online.